Why do all believe that smaller process nodes decreases the cost of manufacture the chips? Yes: You can fit more die candidates on a smaller process node, but the wafer price is raised for each new processor node. Apple must have hired hundreds/maybe thousand of people working on their SoCs. PA Semi + more. To make a new tapeout/masks for exactly the same processor that is used today. I can't recall that in history. If we believe the rumors that Apple got test wafers from TSMC june and october last year, then Apple designed at least 3 SoCs last year. "This is nothing new, but it's always interesting to get an idea of the amount of variance Apple considers acceptable." I have complained to Apple about how irritating it is to have items that should be consistent (think of contact photos shared via iCloud for example, where the human eye is very sensitive to minute variations) appear different on iMac, iPad, MBA, and iPhone screens; and I suspect Apple is sympathetic to the problem. But screen technology is where it is today, and right now we have to accept these sorts of variations as part of the deal (different companies, different processes, lots of experimentation) that gives us really amazing quality screens for just a few hundred dollars each. Maybe in ten years we'll be in a position to deliver a single consistent screen appearance across the entire product line. 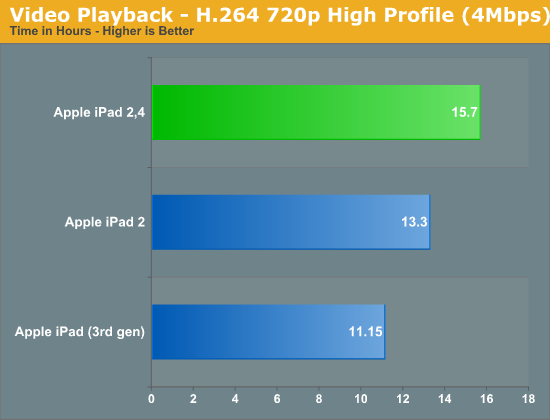 Was this a comparison of a brand new iPad 2,1 to a brand new 2,4? I ask because the 15% gain seems dubious when the CPU is such a tiny portion of the overall power budget. 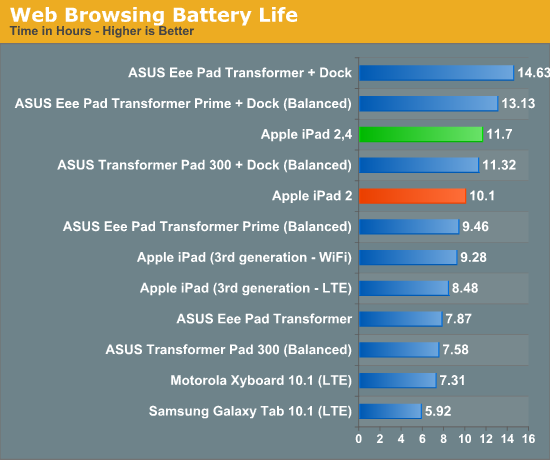 What I do know is that over time LiON batteries lose their charge capacity, so comparing a year old iPad2 to a brand new iPad2 would show the new one as having better battery life even if they had identical internal hardware. 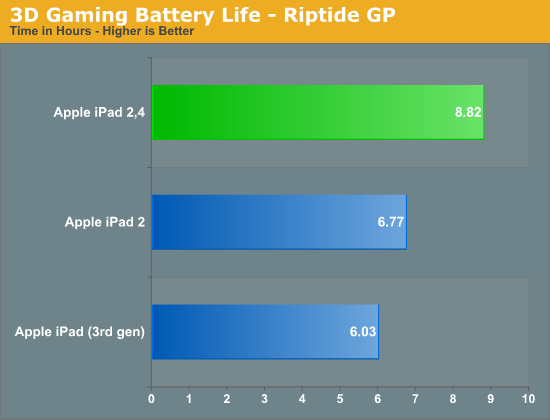 All of the tests were re-run on a newer but not brand new iPad 2, with very few charge cycles (< 20) on the battery. 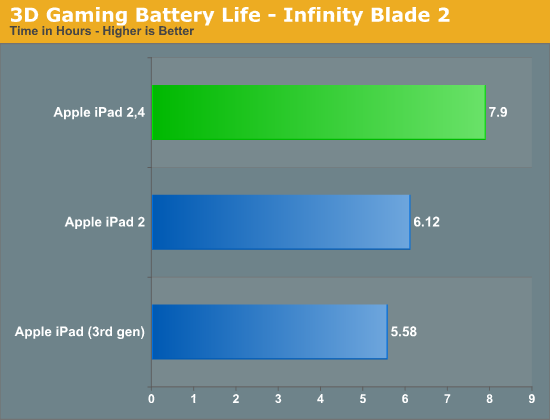 I also ran a test comparing battery life of the older iPad 2 at new vs. when tested and showed no measurable decrease in battery life (you can actually see that video playback battery life hasn't changed even compared to our original iPad 2 review). Finally, the power consumption results remove the battery from the equation and validate the difference in power.